Fun Fact: We also serve our full Dinner Menu during brunch! Live Jazz 12:30-3:30pm every Sunday. 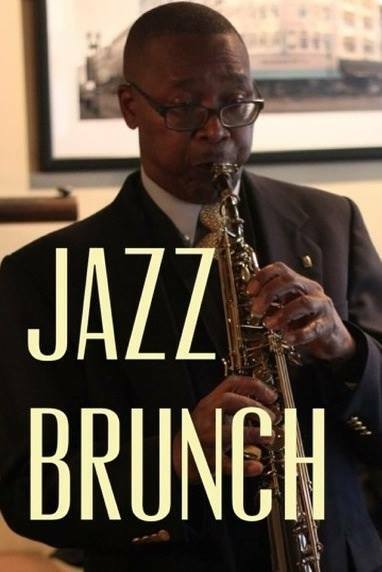 What's a better combination than champagne and jazz for a Sunday brunch? Our Sunday brunch features a wide array of favorites, and some special creations available only at the Downtown Grill & Brewery. We offer happy hour specials from 11-10pm. Tantalize your taste buds with one of our Mexican-style brunch items! Sizzling hot plate layered with Mexican veggies, brunch potatoes, scrambled eggs, and your choice of either grilled ham, grilled chicken, or smoked sausage. Served with sour cream, mixed cheese, pico de gallo, and four warm tortillas. A sauteed mixture consisting of tomatoes, onions, bell peppers, chicken broth and seasoning, then mixed with corn tortillas and topped with eggs and served with side of fruit. A large flour tortilla stuffed with scrambled eggs, sausage, mixed cheese, and diced peppers. The final touch is to top it with our homemade queso. It comes with two side items. Our version of the Mexican classic consisting of crispy tostadas, 2 eggs cooked over medium topped with sauteed tomatoes, onions and fresh jalapenos., Comes with two sides. Unique only to the DTGB, we cook seasoned eggs in a muffin pan lined with bacon. Once the form of mountain is created we top them off with cheese and serve them with 2 sides. It's breakfast...in a bowl! We add grits, scrambled eggs, sausage and mixed cheese baked and topped with bacon bits! Our fresh, homemade southern sausage gravy poured across our warm freshly made biscuits. Comes with 2 sides — a true classic! Made fresh daily in a variety of styles. Ask your server about today's treat. Served with fruit. A beautifully mesquite grilled 5 oz. sirloin accompanied with 2 eggs and 2 sides. Covered in maple syrup, powdered sugar, and sprinkled with love. Comes with 2 sides. The open-faced omelets come in a variety of styles and we happened to snag a few of them. All of these come with two sides of your choosing. Topped with capers, sliced mushrooms, spinach, onions, and parmesan cheese and a side of peperoncinis. Topped with diced tomatoes, chopped garlic,, spinach, oregano, and mozzarella cheese. Topped with diced tomatoes. mixed cheese and bacon crumbles. These closed frittatas come in a couple of our own designs and then we give you the opportunity to make your own. All of our omelets come with two sides. Stuffed omelet with roasted red peppers and mesquite grilled chicken. Served with a side of our homemade roasted red pepper cream sauce. Stuffed omelet with ham and mushrooms sauteed in salsa. We top it all off with mixed cheese and serve it with a side of jalapeno slices. Choose 3 items from the list below to build your omelet to your specifications. If you want to add more things, we'll let you add more for .50 a piece.